As regards inhabitation in Tammisuo it is known that there were a couple of crofts in the area in the middle of the 19th century. At the end of the century Russian Empress Catherine II had donated the area of Saarela mansion, which also covered Tammisuo, to Count Fabian Steinheil. He was the governor general of Finland in 1810-1824. Actual inhabitation and industry moved to Tammisuo after the Karjala track was finished. Young, just graduated Juho Hallenberg bought the Saarela mansion lands of 1188 hectares in 1898. The transaction also included Tammisuo. At the end of the 19th century Hallenberg founded a brick factory in Tammisuo. It was expanded in 1909-1910. He also founded a sawmill and a joinery shop. Later the production expanded to a mill and foundry. A narrow track went from Tammisuo area to Papulanlahti shore where the loading dock of Hallenberg factories was located. In this way, it was possible to load the products directly to the lighters operating in Saimaa Canal. 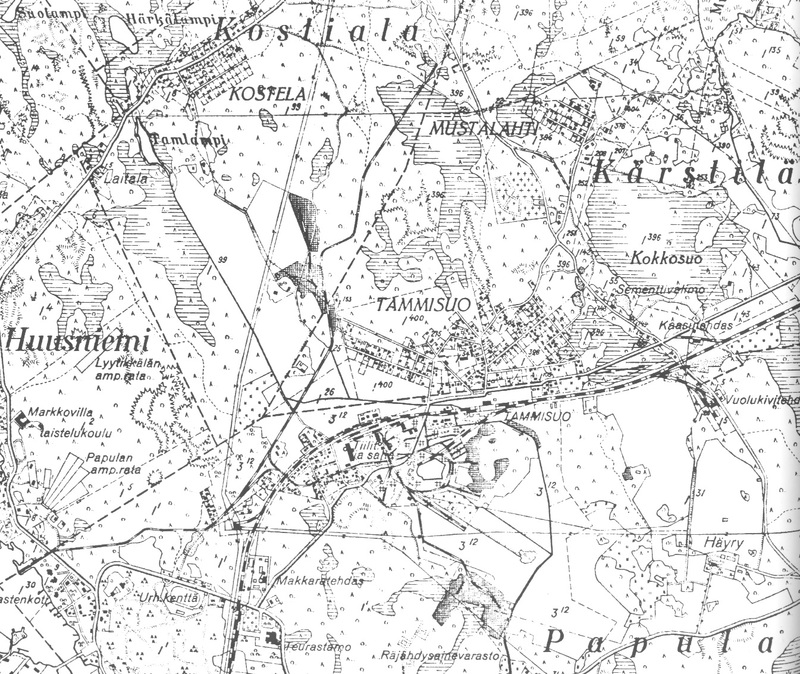 Later the Karjala track went next to Tammisuo. In the 1930s Tammisuo had a brickworks, sawmill, planing mill, joinery shop, and mill, and meat processing factories of Osuustukkukauppa and Oy Marschan Ab, Karjakeskuskunta rl, Suomen Sementtivalimo, Suomen Vuolukivi Oy, maize mill of Keskusosuusliike Hankkija, foundry of Viipurin Sementtivalimo Oy, and Suomen Vuota Oy were also located in Tammisuo. Traffic Contractor Onni Tuovinen bought the cars of Tammisuon Auto-Osuuskunta in the 1930s and continued service between Tammisuo and the centre of Vyborg.